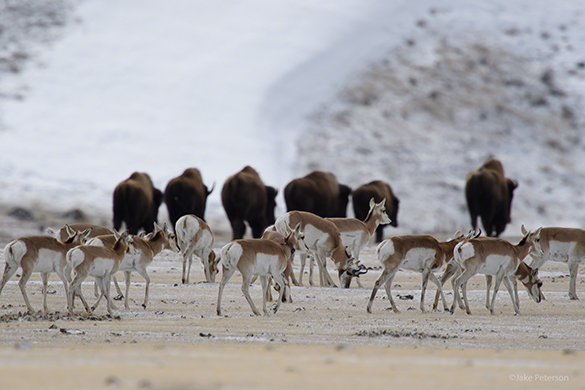 If there are two animals that really sum up “the plains” it’s the Bison and the Pronghorn. These are true plains mammals. Both were hunted for their hides and meat and at one point were on the edge from being over hunted. Today both can be witnessed throughout the west. Photographically these two mammals couldn’t be further apart. One is massive and dark brown the other is tiny and a bright tan/white. Both together they represent a history. This morning was perfect for the two of them as the cloud cover created a nice scrim to diffuse the light so neither stuck out or blended in. Using the D5 and 600 f/4, I watched as the two herds moved by each other.